Sermon: You Cannot Serve God and Wealth - Almighty Father, your seeking servant prays for guidance. 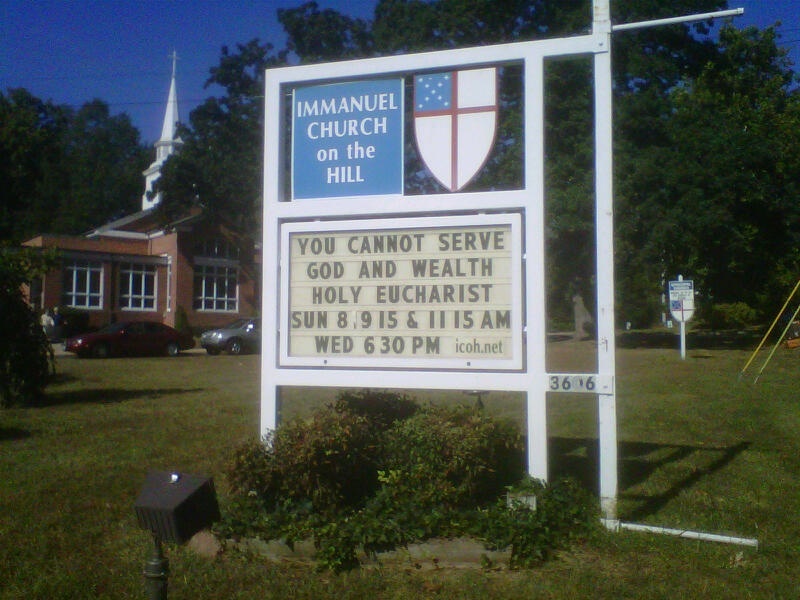 Sermon preached at Immanuel Church-on-the-Hill in Alexandria, VA September 22, 2013. Come, Holy Spirit, fill the hearts of your faithful, and kindle in us the fire of your love. Send forth Your Spirit, and we shall be created, and you shall renew the face of the earth. Amen. There's a fable about the time when a $5 bill and a $50 bill met one another in the bank teller's drawer. "Where have you been?" the $5 bill asks the $50. "Oh, I've been to places you've never dreamed of," says Ulysses S. Grant to Abraham Lincoln. "Fancy restaurants, casinos, shopping malls -- every week brings something different. How about you?" "Oh, my life isn't nearly so exciting as yours," admits the one, dejectedly. "Every week it's the same old thing: church, church, church!" The rector kicked off our annual intentional giving campaign last Sunday. But I remind us now what we see a lot here at Immanuel -- that "Stewardship is everything we do after we say, 'Yes, I Believe.'" So now it’s my turn to talk about money and wealth. Whereas the rector chose the analogy of Time, Talent, and Treasure, I'll employ a different letter of the alphabet. Let's try 'S', as in Self, Service, and Substance. Self, Service, and Substance. And there may still be yet one other way to imagine Stewardship as "Vision, Mission, and Commitment." In St. Luke's Gospel, Jesus tells a parable which speaks to the purpose of money. It has been said that this story about the dishonest manager is one of the most challenging of all the parables that Jesus told. Incompetence and dishonesty seem to be rewarded. But, I’m fairly positive that that isn't the message of this parable. In verse 9 when Jesus speaks about "dishonest wealth," the Greek word adikia means 'unrighteous' or 'dishonest.' Dishonest wealth was counted as those interest monies or profits that came from usury, the illegal action or practice of lending money at unreasonably high rates of interest. The Jews were forbidden from lending money at interest, but they found their own version of a loophole: they could lend out commodities such as oil, corn, or wheat, and charge interest on those goods. Here this rich man, through his manager, was assessing his neighbors’ interest. It is this illegal profit to which Jesus points as dishonest wealth. When the manager finds that he is going to be fired, he tells all those who owe his master to dispense with the interest. They need only return that they first borrowed and no more. What the manager bought was friends and favor for the future if and when he should become unemployed. Not necessarily dumb! But not altogether good either. The dishonest manager was not punished by the rich man, for in acting so, he brought favor upon his master as well. You could be swayed to think the manager’s actions made his master appear pious. It’s a curious story. We cannot put our security in money. Bank accounts, bonds, stocks, real estate, or gold all have fluctuating worth. Certainly those who lived through the Crash of 1929 and the Great Depressions were well aware of that. Reportedly in Germany following the First World War, people traded wheelbarrows full of money for a loaf of bread. In the late 1970s and early 1980s, the bond market bottomed out and gold dropped to one-half its original value. I don't know about you, but following the most recent financial downturn, only now is my portfolio beginning to show signs of true resuscitation. Now there are people today, survivalists they're called, who are actively trading their money for a camp in the woods that is stocked with guns and food. Good Lord help us! The future is uncertain and we dare not put our hope in such material things. Money is meant to be a source of blessing, not a tool of power. It is to be used to bless you, your neighbors, and the world. And yet, sometimes, money exercises power over us and others. Wealth can be an active power which demands devotion, and that devotion becomes an active rival to God. I realize that growing up white, with privilege, as the son of a Navy captain, my family and I had our share of this world’s goods. And there was a time when I let the things I had become way too indispensable to me, and sometimes considered them irreplaceable. Even now, Chrissie and I sometimes marvel at all the stuff we have more so than the things we don’t. When Chrissie and I bought our first home together, I remember I was more inclined to behave as if we existed to maintain our home—to keep it clean and in good condition. Fortunately, Chrissie and I have come to share the idea that a well-loved home doesn’t necessarily mean a totally neat and tidy house. In fact, we often agree to host parties that require we clean house. We realize a house is supposed to serve our needs. Things are to serve people; not people, things. That’s a good lesson. Yet we may still have some hang-ups about our money; who earns it, who spends it. I read somewhere that Socrates was trained to be a stonecutter and yet he never spent a day of his life cutting stone. His wife worked to support him and their three children, so he could provide free lessons to students. That sounds so much like Chrissie supporting us after I left my career at Visa to discern to what and where God would lead me, and us, next. She supported us while I went to seminary. I wish I could tell you that I wasn't hung up on making a living, and was comfortable in the happy arrangement Socrates had and that Chrissie provided me. A steady and adequate income is a great plus in life, but it is not the primary thing, and as we all know, there are too many who have too little to make life great for themselves or those they love. There is much need in this world, and too many people still wonder where valued work can be found for a just wage, where food enough will be available for their next meal, or where they might lay their head to rest and sleep in some kind of comfort. So money is not the root of this story's message. I suggest to you the real message of this parable is that Jesus wonders why his own followers are less creative and diligent in their stewardship given that they are managers of a far more valuable household. Why is it that the work of God so often takes second place -- not only in terms of money, but also in terms of time? Or, to use my 'S' terms -- how we think about what we do with what we have and how we do for others: Substance and Service. As hard as the children of light work and as generously as they give, there always seem to be "children of this age" who are working harder and contributing more -- sacrificing their offerings at the altar of self-interest -- hardly the same as offering yourself to God. As we are invited to consider what it means to be stewards (rather than owners) of all that we have, it is crucial to recall that we are all bought with a price. “Christ Jesus, himself human … gave himself a ransom for all.” Apart from the generosity of God we have nothing – we are nothing. By God’s gracious favor we have everything we need. This parable might be what we could call a "how much more" type of rabbinical story: "If these scoundrels will go to such great lengths to get what they want, then how much more should God's people work to assure that God's will is carried out?" If the shysters and charlatans of this world -- motivated by nothing but self-interest -- can be so shrewd in managing the resources at their disposal, then how much more should God's people, motivated by justice, be shrewd in using their resources for God's purposes? "Be wise as serpents, innocent as doves," Jesus teaches elsewhere (Matthew 10:16). In God’s economy, people matter more than profits. The prophet Jeremiah, the Psalmist, and Jesus, the teller of parables agree on this, with the epistle writer adding a prayer for “a quiet and peaceable life in all godliness and dignity” (1 Tim 2:2) for everyone. The rich man and his manager engage in a power struggle in the surprising—and difficult to interpret—parable. This master praises the dishonest manager for his cleverness, but Jesus’ point isn’t to commend dishonesty but rather to urge his followers to be zealous and clever in preparing for the kingdom of God—and to care less about worldly goods. Friday's reflection in Daily Feast by Helen Montgomery DeBevoise, co-Pastor at Park Lake Presbyterian Church in Orlando, FL: "Somewhere in the middle of our journey we stopped living for Christ. We stopped believing that Jesus died and was resurrected and that life was made new. Somewhere along the way it became easy to serve all those pressing demands; of people, of schedule, of money. Somewhere along the way, the vision of God's call became cloudy and muddled. We stopped hearing God's voice and joined the crazy survivor-takes-all mentality. Somewhere along the way, the challenges seemed so much bigger than the answers. So we huddled in an effort to save whatever was left and forgot about living for something greater. We buried our treasures." Stewardship is not passive; it requires an active response. And it is good and right that when we prayerfully consider our giving, that it come from our abundance, and not from our leftovers. The first 10% off the top, the first fruits of our labors in recognition of the many blessings we have received from above. Time, Talent, and Treasure. Self, Service, and Substance. Vision, Mission, and Commitment. If we have a Vision for what the Kingdom of God here on earth might look like, then we can undertake that Missions to work towards it and accomplish it, and we will only succeed if we have the Commitment to get it done! The real question is: do you own your money, or does money own you?